English garden roses are the antidote to the odorless, tightly bound rosebuds you see at the supermarket flower stand. These roses feature heirloom rose fragrance combined with modern disease resistance and a reblooming habit. 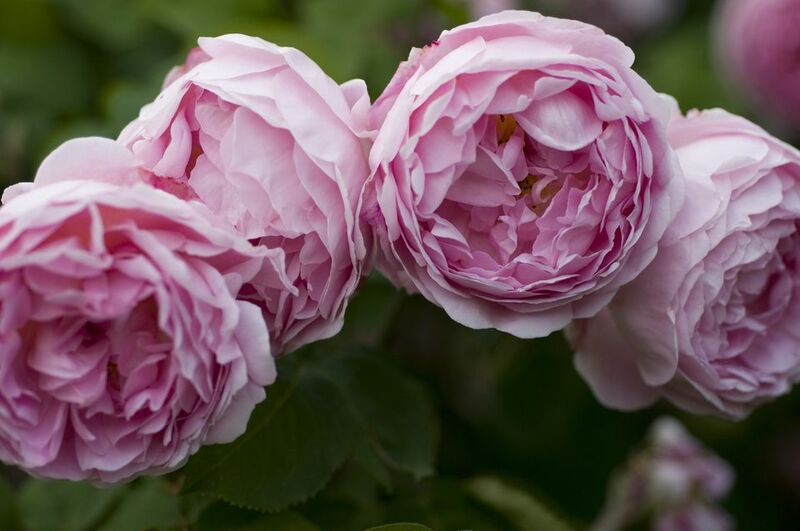 Also called David Austin roses, English roses come in shrub and climbing form to suit any garden space. 'Fair Bianca' inhabits that sweet spot between white and cream that gives it a glowing appearance. A reliable rebloomer, 'Fair Bianca' is coveted by brides who want to give their wedding flower arrangements old world flair. The very compact growth habit of 'Lady Emma Hamilton' makes it ideal for a large patio container. Can you imagine the fruity fragrance scenting the summer air at your next gathering? The upright growth form is also well suited to growing as a "rose tree" standard. The pink sunrise hues of 'Janet' are similar to the popular 'Peace' hybrid tea rose, but with a greater petal count. 'Janet' does best in regions with low humidity that don't encourage black spot and powdery mildew development. With the 'Gentle Hermione' rose, you get more of everything you want in a rose: more fragrance than most (even among English roses), more petals at 90 per blossom, and more disease resistance than many roses, even in rainy areas. This rose is named for the wife of King Leontes in the Shakespeare tragedy The Winter's Tale. 'Happy Child' produces rich golden blooms that won't fade in strong sunlight. Like all English roses, 'Happy Child' is at its most prolific with rich loamy soil, regular fertilizing, and six to eight hours of sunlight each day. The loose form of 'Mary' English rose allows admirers to gaze at each and every one of the 60 clear pink petals on these June blooming shrubs. Some compare the fragrance of 'Mary' roses to almonds and honey, and if you garden without chemicals, you can garnish your salads and desserts with the edible flower petals of this rose. Named for a beloved English journalist, 'Sir John Betjeman' features bright magenta roses that stand out in the summer landscape. This rose is an alba hybrid, which means that it carries the traits of excellent fragrance and disease resistance that have made it a garden mainstay since antiquity. The peach hue of 'Crown Princess Margareta' is positively juicy, with a fruity fragrance to match. This sumptuous variety is said to be more shade tolerant than others and its arching canes make it suitable to train as a climber. If a single plant can set the mood in a garden, it's the 'Munstead Wood' English rose. The rich berry-toned blooms smell as wonderful as they look, and the tidy growth habit is just right for the container garden or the edge of the border. This variety is named after the home of British horticulturist Gertrude Jekyll. Not just another pink rose, the 'Mayflower' is all but impervious to disease. Good-bye, toxic sprays and chemicals. 'The Pilgrim' is notable for its shade tolerance, offering superior performance in as little as four hours of direct sun. Good disease resistance, 140 petals per flower, and a strong fragrance add to the appeal of this 1991 introduction. Finally, a red rose you can present to your loved one that features a real old-world rose fragrance. Introduced in 2000, you may see a large planting of this rose variety at Shakespeare's birthplace in Stratford-upon-Avon. 'Winchester Cathedral' produces dozens of white roses with abundance in the early summer, followed by occasional flushes throughout the growing season before an exuberant fall finale. The compact shape looks pleasing as a flowering accent in a formal garden.